Captured Wishes: Anniversary Wishes for Her have Never Been Better! Coming up with memorable anniversary wishes for her is quite a challenge, isn't it fellas? Coming up with unique and chic anniversary gifts year after year is a difficult task. You don't want to clutter the house up with thoughtless "items" that mean nothing, and depending on how long you've been together, chances are your significant other already has everything that's needed for the kitchen. Even if your spouse could really use a new frying pan, that is not an appropriate anniversary present. For an anniversary, you want something special, the perfect and unique keepsake gift. You can give her a frying pan any time of the year. An anniversary is a time for a gift from the heart. A gift that shows how much your love of your life means to you. A gift that shows how glad you are that you have had another year together and you wish for many more to come. A special gift that shows her how glad you are to be with her and how happy you are that you met. You can try to say all of this with words, but sometimes the right words just don't seem to cover how deep your feelings go. Or maybe you can't put your feelings into words at all. In many cases we give gifts so that we don't have to say anything because we just don't know what to say. Are there gifts that say what we really feel? Gifts that are unique and special? Not something she is likely to go out and buy for herself? Captured Wishes has the perfect solution to this age-old gift giving problem. A Captured Wishes gift is truly designed to eloquently and romantically express what it is that you know you want to say but can’t find the words to. Put simply, it’s all about your desires or wishes for your continued relationship with your significant other. These "wishes" are beautifully packaged into an ultra cute and tiny glass vessel that is filled with layers of brilliantly colored holographic wishing dust. Each color, or "wish", symbolizes life around us. 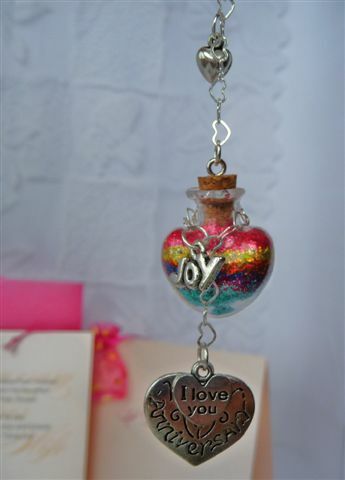 This little bottle is also adorned with beautifully themed charms attached to heart-shaped link chain. And to complete this palm-sized package there is a message card where the words and sentiments are those you exactly want to express, describing in great prose what the magical layers mean. Any time you have to be apart because of work or for some other reason, she can pull out the the super-cute anniversary wishes gift you gave to her on your anniversary and be filled with the same joy she felt on the day the two of you were married. Anniversary wishes for her from Captured Wishes is a timeless wonder. You don't have to worry about which anniversary is which. You never have to remember if five years is paper or diamonds. Every year is the perfect year for a gift from Captured Wishes. Every year, from year one to year one hundred, anniversary wishes for her from Captured Wishes is the perfect choice. Your heart is filled with love, joy, peace and hopes for the future. This special, unique and chic gift is the perfect symbol for the feelings in your heart. Every grain of pixie dust represents your deepest feelings. 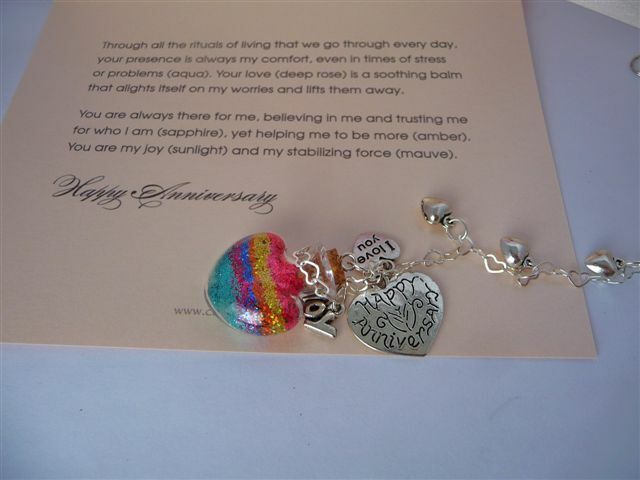 Nothing says "I love you" like the unique and chic anniversary wishes for her gift from Captured Wishes.